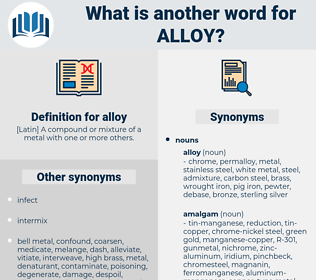 What is another word for alloy? [ Latin] A compound or mixture of a metal with one or more others. grow, expand, increase, raise, extend, praise, upgrade. detach, divide, purify, separate, disconnect, unmix, not mix, clean, clear. Two of those tools were never found of the same alloy; the Indian smith simply guessed at it, and had to throw away many a tool for every one he accidentally made. Copper, tin, and their alloy, bronze, were the most essential of them. ali, ala, aeolia, alula, aloe, aloha, ally, awl, allah, ailey, al, allow, aalii, all, aioli, allyl, aliyah, allele, alley, ail, alleyway, allay, awheel, awol, alalia, awhile, ale. electrum, invar, solder, pinchbeck, Babbitt Metal, pewter, nickel silver, wood's alloy, carboloy, sterling silver, dental amalgam, oreide, babbitt, bearing metal, wood's metal, inconel, duralumin, copper-base alloy, shot metal, pot metal, type metal, amalgam, 18-karat gold, German Silver, stellite, white metal, nickel alloy, oroide, 22-karat gold, tombak, fusible metal, tombac, Cheoplastic Metal, white gold, steel, heavy metal, Britannia Metal, dental gold, pyrophoric alloy, alnico, nickel-base alloy, tambac. commingle, combine, devalue, coalesce, immix, flux, meld, merge, blend, mix, conflate, fuse. primary solid solution, solid solution.